Click small photos to enlarge and sharpen! 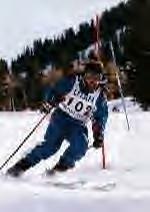 My first real race--Snow Basin Master's Chilling at the top of the world--Snowbird. Sometimes a steep climb to get to the turns. From Left: Joe Brent(one guy-2 names), Scott, ski bud "EJ" (a.k.a. the tree-seeking "Tree J"), Nick, and me. You can tell from the look: If you see this gang coming at you; be afraid. Be very afraid. The day the streak began, Oct 1992. Ski stuff at Wholesaler's prices! 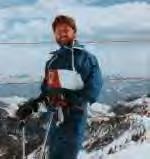 (Info/reviews for any Ski Resort on Earth) THE BEST! Next Q: What is the longest anyone has alpine skied without stopping?